In the shadows of "The City that Never Sleeps," is a golf course that's joined the likes of Pebble Beach, Whistling Straits and Pinehurst No. 2 atop every golfer's bucket list. Pound Ridge Golf Club, just north of New York City, is the Empire State's only Pete Dye-design. Since its 2008 opening, golfers have flocked to the course to soak up the work of one of golf's most acclaimed designers. October and November are "peak season" for a fall foliage getaway to the Hudson Valley. Business and vacation travelers alike can experience the Northeast's most vibrant colors while playing golf at one of "America's Most Stunning Courses," as described by AskMen.com. Crafted by Dye and his son Perry, Pound Ridge is hewn from 172 acres of magnificent cliffs, streams and wooded hills. Playing at 7,165 yards from the back tees with a par of 72 and a slope of 146, Pound Ridge features five sets of tee boxes making it appealing to short and long hitters alike. Dye's wife, Alice, has a say in her husband's work and like she has done for Dye courses across the world, Alice made sure Pound Ridge included fair, yet challenging options for people wishing to play from the front tee boxes. Signature holes include the par-5, 13th, home to "Pete's Rock," a giant boulder resting in the middle of the fairway; and the par-3 15th hole, dubbed "Headstone," which is flanked on the right by a large rock outcropping protruding into the elongated, 9,000-square-foot green. While many classic courses don't send out messages beckoning golfers to return, Dye's layouts have the opposite effect, and Pound Ridge Golf Club may be the most magnetic of the bunch. After playing it once, golfers want to go right back out and tackle its plethora of strategic puzzles. Dye disciples who have sojourned to PGA West, TPC Sawgrass, Harbour Town, Kiawah Island Resort and the American Club take notice: Pound Ridge Golf Club is an essential part of any golfer's collection, and even more accessible than the aforementioned shrines due to its location just minutes outside of New York City. Pound Ridge has stay-and-play agreements with seven area hotel properties in New York City, Westchester and Fairfield Counties, offering full golf concierge services including complimentary rental clubs/shoes ($100 value), booking tee times and arranging transportation. Hotel partners include: Mandarin Oriental and the Marriott Marquis in New York City; Castle on the Hudson and The Ritz-Carlton in Westchester County; and Delamar Greenwich Harbor, Hyatt Regency Greenwich and the Stamford Marriott Hotel & Spa in Connecticut. Several of these properties offer spa treatments. 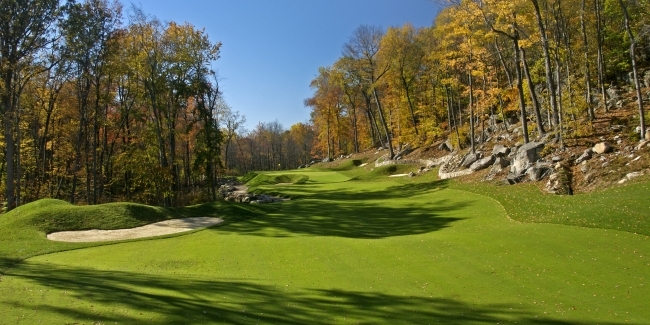 To book your fall foliage getaway to Pound Ridge Golf Club, visit www.poundridgegolf.com or call 914.764.5771. Marcus Davies is a regular contributor to GolfTrips.com and GolfWisconsin.com. Marcus has traveled coast to coast playing some of the United States finest courses. Marcus lives for fairways and greens in the midwest. In addition, he is a connoisseur of craft beers and fine cigars. NYGolf.com is a golf directory featuring golf course directory and golf planning tools. Copyright CityCom Marketing, LLC - NYGolf.com - All Rights Reserved.